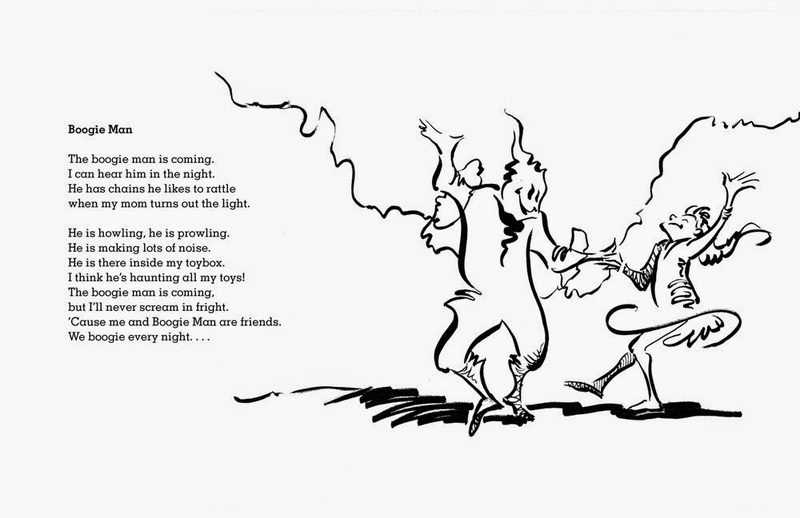 As a kid, I loved the wacky poetry of Dr. Seuss and Shel Silverstein. They twisted words like a verbal gymnasts, making them dance and flip in my head. 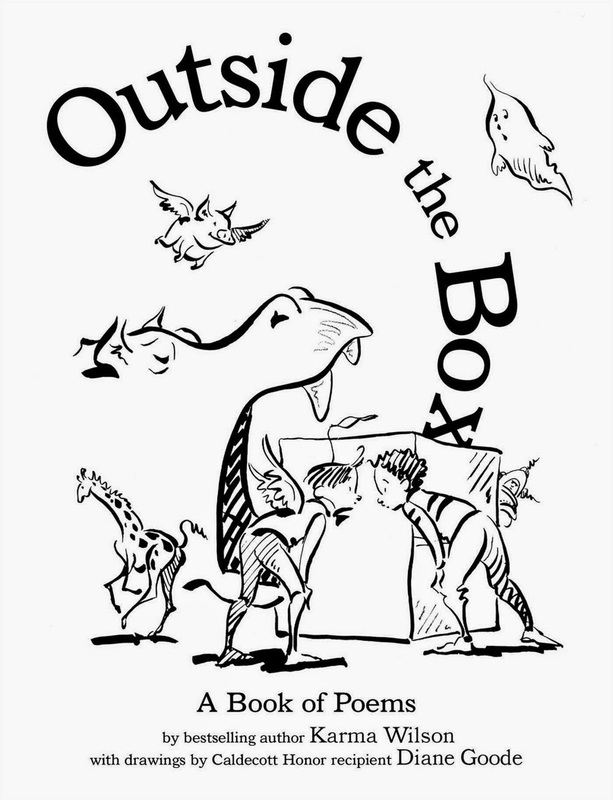 Their humor still resonates with kids--which is why they love this new collection of poems, Outside the Box, which combines quirky observations, outrageous situations and unexpected twists just like the great Seuss and Silverstein did. 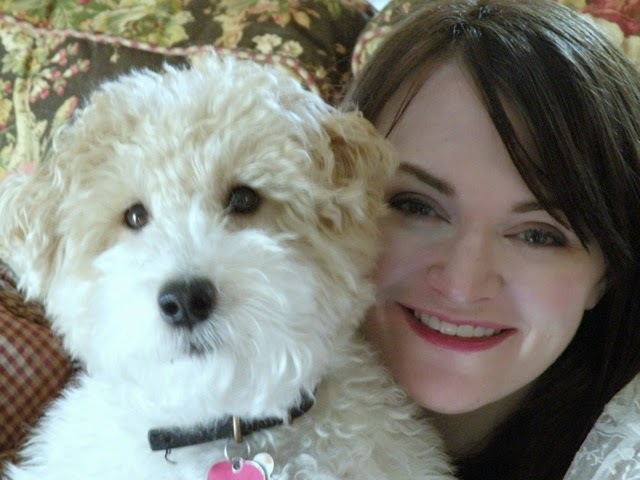 Wilson declares from the very beginning that humor's her game, but she always invites young readers to see more in a situation than there is at face value. Her poems are full of familiar situations, from playing hide-and-seek to wanting the coolest shoes. Her rhythm and rhyme will make you want to read them aloud, with a smile on your face. But these poems also have an edgy feel, dipping into nightmares, ghosts and werewolves. Just take her poem, "Boogie Man" with the "chains he likes to rattle." Dark and creepy, until you come to the word play: "'Cause me and Boogie Man are friends. We boogie every night." Diane Goode's illustrations do a lovely job of adding humor or making light of awkward situations. For more of her illustrations, take a look at all the draft and finished artwork she shares on her website. Not all of the poems are "deep and meaningful" -- some just make us laugh. I hope you enjoy sharing poetry with your kids. It can bring laughter, it can sprinkle sunshine, and it can warm the heart. The review copy was kindly sent by the publisher, Margaret K. McElderry/Simon & Schuster. If you make a purchase using the Amazon links on this site, a small portion goes to Great Kid Books. Thank you for your support. WOW oh WOW. When a book hits a sweet spot, it zooms from one student to another. As soon as I read the opening lines of The Crossover, with its basketball cover and bouncing rap beat, I just knew I had to read it aloud to my 5th graders. But nothing prepared me for how it hooked them. To say they are loving it is an understatement. Fifth grade boys are just about wrestling each other to see who's going to get it next--jostling each other over a poetry book! The power of this novel comes not only from Alexander's language but also from the characters and their emotions. As Josh and Jordan (JB) near the championship playoffs for their school's division, friction develops between the brothers and trouble is brewing with their father. Josh starts to resent the fact that JB is spending too much time with his new girlfriend. I love the relationship Josh has with his dad. They tease each other, push each other, question each other in a way that feels so real. Alexander engages kids on so many different levels. I especially like the Basketball Rules that Josh's dad shares with his sons. How is basketball like life? That's something all sorts of kids can think about, in a way that takes layered meanings to a different level. 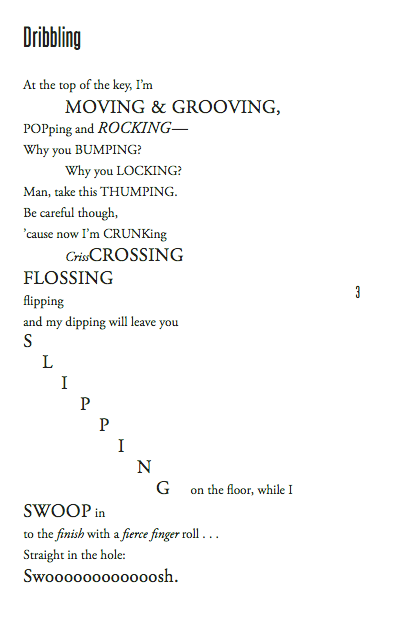 Our whole class is having a blast reading this aloud. I am projecting it on the screen so we can see the words dance on the page as I read it aloud. I want to try to create some audio recordings with kids reading it, because I know they'll bring so much to it. We already have four copies at school and the books are bouncing from one kid to another. 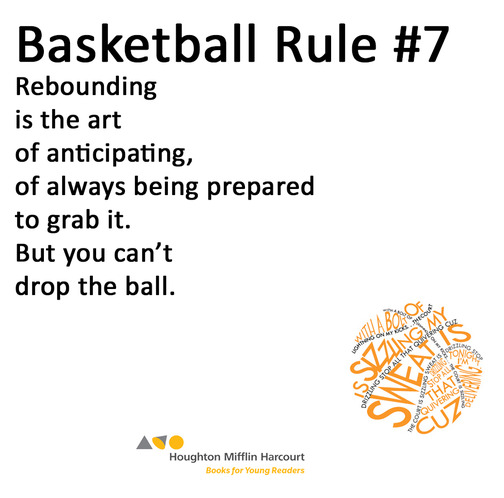 I can't wait to show the kids this video that Kwame Alexander made to share The Crossover with librarians. I just hope parents and teachers can find it in their local bookstores. 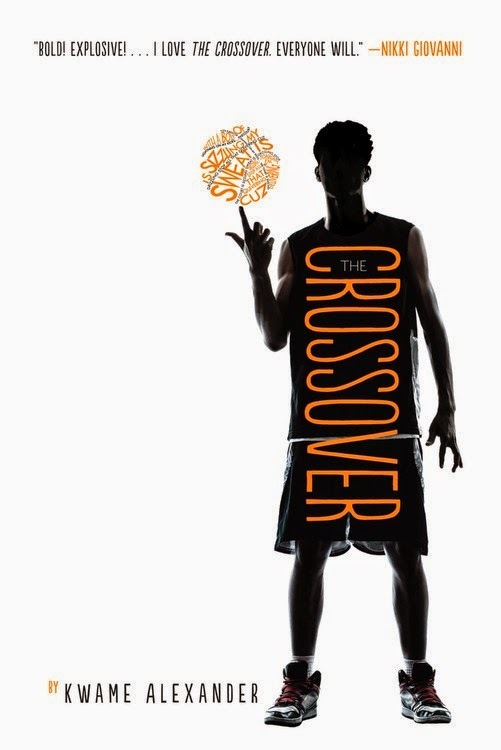 If you haven't heard of The Crossover yet, you're officially on notice. Here's your chance to read this book before the awards talk. And, yes, there should be serious awards talk about this book and not just because it has already received five starred reviews but because it is a breath-taking and dazzling fast break work of art. So, forget the awards talk (though it will certainly be warranted) and believe me: you should know this book because you'll want to put into kid's hands and share it with them. I couldn't agree more. I also want to put this into every 5th & 6th grade teacher's box across the country. Please share this with a teacher, a kid, a family you know and love. The review copies came from our school library. If you make a purchase using the Amazon links on this site, a small portion goes to Great Kid Books. Thank you for your support. The Common Core State Standards are nation-wide standards that outline what skills each student should be able to do in mathematics and English Language Arts. They were developed with the goal of preparing our students to be college and career ready by the end of high school, planning how to work up to that end point. Our students in Berkeley are in the middle of taking the new online SBA tests. It is a field test year, and no results will be tied with individual students. But I can assure you that you’ll be hearing lots about the Common Core in the coming months as the statewide results come in. So, what’s my attitude? I believe that there are positive aspects to the Common Core and concerning aspects. I’m both a glass half-full and glass half-empty type of person. Please try to separate what you hear about the assessment from the curriculum. In my opinion, many of the standards are based on solid, important teaching goals. That’s my focus today -- to help you see how our library work can support those teaching goals. As librarians, we pour in more water, improving students’ skills by providing access to engaging, relevant material. What do librarians have to do with all this anyway? The Common Core asks students to read more nonfiction, to use more primary sources, to consider author’s perspectives and opinions, and to read more. Can teachers provide all this material for students? I don’t think so. Can families? No -- no one can do it on their own. Librarians can provide essential support to students, teachers and families in their communities. Below is a presentation I gave this week to the California Library Association. I've tried to encapsulate my views on key ways librarians can support students, teachers and families. We are all in this together. If you have any questions, I'd love to hear from you. We are all on a learning journey together. Many thanks to all of my colleagues at Berkeley Unified School District. I have learned so much from all of you. The views expressed here are mine alone, and do not represent my employer. 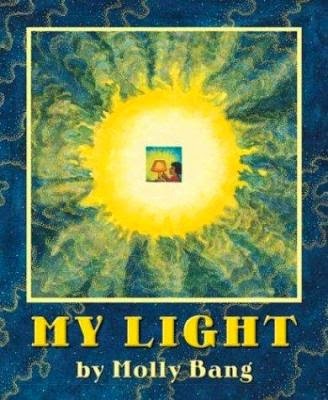 Molly Bang inspires me with her luminous artwork and her ability to convey complex scientific processes through a narrative story that appeals to young children. 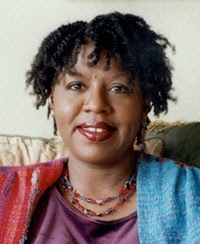 I wanted to talk with her about how she tries to convey her understanding of the way our Earth works to young children. 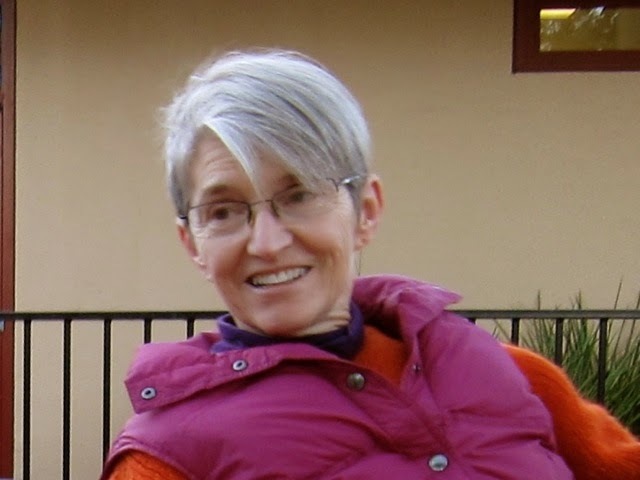 She has written several books with her longtime friend Penny Chisholm, a biologist from MIT who studies microscopic phytoplankton and photosynthesis. MAS: What were your hopes and goals in creating your Sunlight Series of books? MB: We are a part of nature. And the more we forget that, the more we are going to be in trouble, as we already are. And what Penny and I are hoping is that with an understanding of how we are a tiny part of the system of the natural world, the better we will be able to make decisions. We also wanted to make these books as literary and beautiful and clear and simple as we possibly could. We both wanted to make these books that children would really want to read, not books that they had to read. And that they would be as good as any kind of a story book. MAS: That’s something I really enjoy about your books, this idea of creating a kind of narrative in the story. I love how the sun talks directly to the child. MB: We tried to figure out a way “in” for each book. So for My Light, the city lights look like stars that have fallen to Earth, and indeed they are. For Living Sunlight, the sun tells the child to hold your hand over your heart. “Feel how warm you are. That is my light, alive inside of you." As soon as we made the sun the speaker, it made all the difference. We kept that throughout, and the trick has been how to involve the child right from the first sentence. Ocean Sunlight begins with, “Dive in,” pulling the child right into the action. 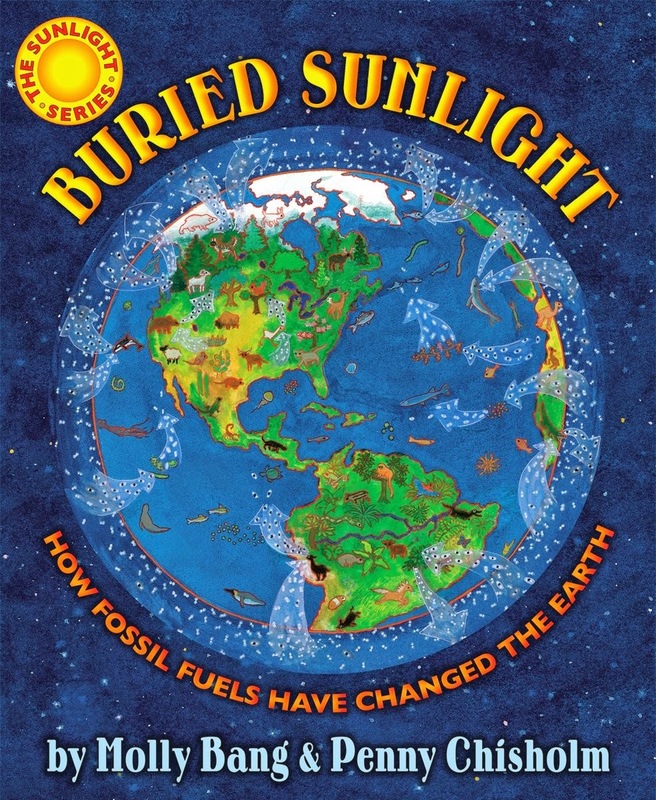 Our newest book, out this fall, is Buried Sunlight: How Fossil Fuels Have Changed the Earth. MAS: Why did you call it Buried Sunlight? MB: Well, that’s exactly what it is! Sunlight was caught in carbon chains millions of years ago and buried under layers of sand and rock. And now we’re releasing that sunlight energy several thousands of times faster than it got buried. It's vitally important for children - and their parents! - to understand this disconnect. 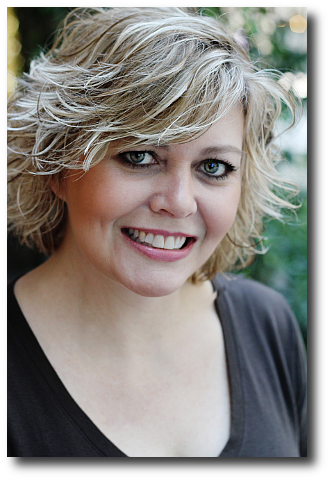 This interview was originally conducted for Parents Press, a local newspaper in the San Francisco Bay Area. I have always been fascinated by the interdependence of species within an ecosystem. As we celebrate Earth Day with our students, I want to highlight two books that help children understand the complex interdependence within ecosystems and our role in help ensure their sustainability. There are no easy answers, but we must help our children understand the factors at play. 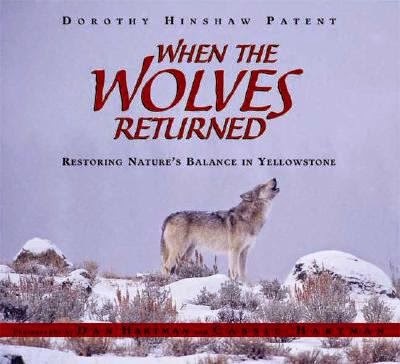 Dorothy Hinshaw Patent explains in clear text the changes that have come about in Yellowstone after the reintroduction of the gray wolf population. The Hartmans' photographs are bold and compelling, illustrating the environment and range of animals that live in this complex ecosystem. The design of this book makes it particularly successful for 4th through 6th graders interested in reading about more complex issues, but without lengthy text. The photographs always take center stage, but the text provides depth and understanding. 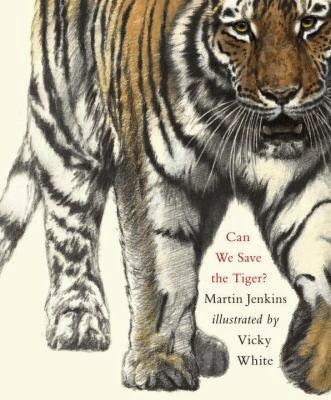 Using straightforward but compelling language, Jenkins starts by introducing the concept of what makes animals extinct. With clear writing, an almost conversational tone, and large print size, this book makes a great choice for 3rd through 5th graders reading nonfiction on their own. Jenkins next turns to species that are barely hanging on: tigers, Asian elephants, sloth bears and the partula snail. He helps children understand the pressure that humans put on large animals like the tiger, who need plenty of room and prey for hunting. Fierce tigers usually eat deer and other wild animals, but when human developments spread into tigers' territory, conflicts arise. Is the Wolf a Real American Hero? After Major Comeback, Is the Gray Wolf Still Endangered? 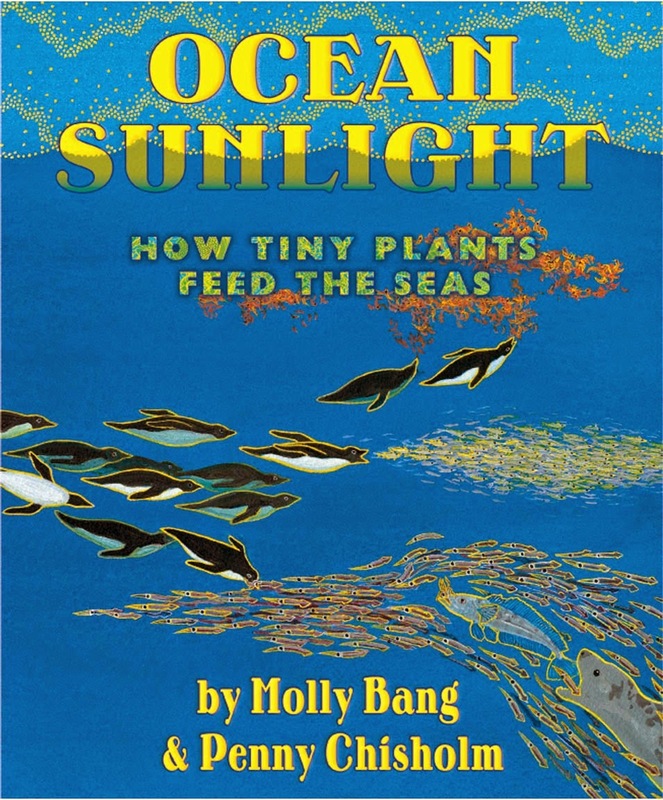 Among my very favorite books are those by Bay Area author-illustrator Molly Bang. She captures a sense of wonder, respect for a child’s perspective and a passion for helping kids understanding the science that underpins the way our world works. I love highlighting these books as we celebrate Earth Day with our students. 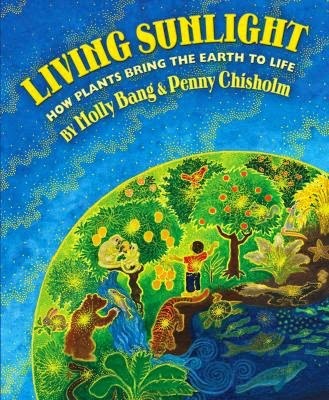 This first book in Bang’s “sunlight series” focuses on how the sun’s energy fuels first the water cycle, then electricity and power for humans, animals and plants on Earth. Connecting the dots from a city lit up at night to the twinkling stars, Bang excels in explaining complex science for young children. The sun narrates this story, telling children: "Lay your hand over your heart, and feel. Feel your heart pump, pump, and pump. Feel how warm you are. That is my light, alive inside of you." The sun radiates across every page, spreading bright yellow dots as it travels. This light "becomes the energy for all life on Earth," as Bang and Chisholm explain. A beautiful, rich reflection that can be read at many levels. The ocean shimmers with the sun’s light, but did you know that the sun fuels a billion billion billion tiny plants called phytoplankton? “Half the oxygen you breathe every day ... is bubbling out of all the tiny phytoplankton floating in your seas.” Bang and Chisholm capture this majestic beauty and fascinating science. 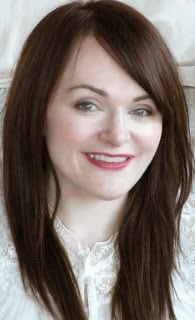 Join me on Wednesday for an interview with Molly Bang. Head over to the Nonfiction Monday blog to read more fantastic nonfiction to share with your children. The review copies came from our school library. If you make a purchase using the Amazon links on this site, a small portion goes to Great Kid Books. Thank you for your support. 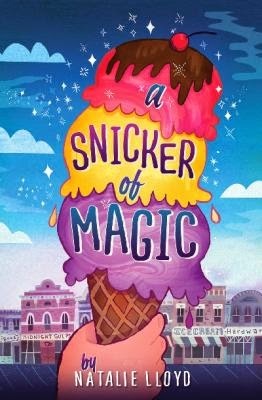 Last week, two girls came bounding into our lunchtime book club bubbling over about how much they loved a new book they both just read: A Snicker of Magic. Their enthusiasm immediately spread to other friends. Hooray!! And so, here is our first book nominated to the 2015 Emerson Mock Newbery, followed by Thea and Fiona's review. A Snicker of Magic is a great book about a young girl, Felicity Pickle, who sees words around people and things .”Some words glow, and some words dance Some have wings , and some have zebra stripes.” After moving (again) to her mom’s childhood home, Midnight Gulch, (which is magic) she learns some important things about her family. But there’s still a gaping hole. Will she find it out in time or is she going to feel the hole forever? We think that the moral of A Snicker of Magic is you can believe in anything you want to and always believe in yourself and your family. Our evidence of this is at first Felicity did not believe in magic until she started learning about her family. What we have in common with Felicity is that sometimes we don’t always believe in something until we have seen or witnessed it. We recommend this book because this story has a really good plot that makes you want to never put it down once you started it. It has magic mixed with family drama , and amazing characters like Felicity and the Beedle, and lots of suspense. Thea enjoyed Natalie's recent post on the Nerdy Book Club, all about the magic of memories that are hidden away in the books we read. This is certainly part of the wonderful charm of A Snicker of Magic. My first novel, A Snicker of Magic, takes place in a quirky Tennessee mountain town called Midnight Gulch. The sugar-wind blows through Midnight Gulch thanks to a famous (er… infamous, rather) ice cream factory called Dr. Zook’s. While Zook’s boasts all sorts of strangely delicious concoctions, the most popular flavor is only sold locally. It’s called Blackberry Sunrise, and years ago, the first batch was made from a crop of wild berries, sugar, milk … and memories. That’s the problem with eating Blackberry Sunrise, as my hero, Felicity Pickle, soon discovers. That particular flavor always calls up a memory. And you never know if the memory will be sweet or sour unless you’re brave enough to take a bite. Sadly, I don’t know how to hide memories in ice cream. But I know how to hide memories in books. For more, head to the Nerdy Book Club post. Thea and Fiona are nominating A Snicker of Magic to our 2015 Emerson Mock Newbery. Our process is that a book must be nominated by two readers to be entered into our final reading list. Students commit to reading at least 5 books from our list to participate in our voting in January. Thank you, Thea and Fiona, for sharing about why you want all of us to read A Snicker of Magic! The review copy was kindly sent to us by the publishers, Scholastic Press. If you make a purchase using the Amazon links on this site, a small portion goes to Great Kid Books. Thank you for your support. Kaiyah C., a fourth grader at Emerson, came to me last week asking to write a review of Nikki Grimes' Words With Wings. You have to know that it takes something special for a kid to ASK to write a review. This book is truly special, and it has found a home in Kaiyah's heart. 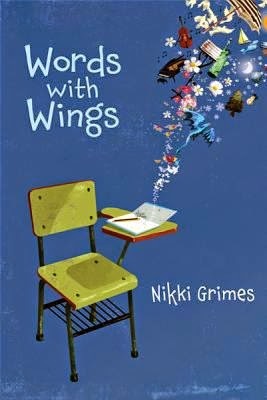 I just read Words with Wings by Nikki Grimes and I really liked this book because I related to Gabby (Gabriella). We both daydream to keep our lives/minds magical so we can throw all our ideas out and put it on paper. Gabby especially daydreams when her parents are fighting. This helps her forget. Gabby and her mom are very different. Gabby’s favorite word is pretend and her mom’s is practical . Gabby is just like her dad. Sometimes Gabby’s mom stops her from daydreaming because she does not want her to be just like her dad. In the end Gabby becomes an author and her mom starts daydreaming too. I enjoyed reading this book because of the way it was written in poetry. I think you would especially like it if you daydream. It would be awesome if we could have 15 minutes of daydreaming, just like Gabby’s teacher told her to do. But I don’t think that will really happen for us. This was a really heartwarming book. This was the best book I’ve ever read. Daydreaming becomes a strong muscle if you exercise it often enough. By the time I was ten, I could lasso a daydream and ride the wind. Who wouldn’t want to do that? There were no lassos where I grew up in the inner city, of course, but there were daydreams to be had, if you knew where to look. That’s the secret I shared with Gabriella, the main character in Words with Wings (Wordsong, 2013). Like Gabby, I was a girl who lived inside her head. Thank you, Nikki Grimes, for writing such wonderfully powerful stories that speak to my students. Thank you, Kaiyah, for such a heartfelt response to Words With Wings. The review copy came from our school library. If you make a purchase using the Amazon links on this site, a small portion goes to Great Kid Books. Thank you for your support. I adore poetry--hooray for National Poetry Month! I love the amazing tumbling, turning and twisting that poets do with words. I marvel at the layered meanings in poems, and I have so much fun with the silliness of other poems. The only the I have such trouble with is memorizing poems. So imagine my delight when I read a whole book of poems just right for me to try to remember! At first glance, this is just a peaceful picture of an island on a summer's day. But Sweet's illustration helps young children understand how "wrinkled stone" might indeed look "like an elephant's skin." As the Horn Book says, "Sweet's expansive mixed-media illustrations -- loosely rendered, collage-like assemblages in seasonal palettes -- are just detailed enough to clarify meaning without intruding on young imaginations." Sweet includes children in so many of her illustrations. Do you see the young child looking out at the island? It's a small detail, but just enough for a young child to put themselves in the scene, to imagine being their on a summer's day. 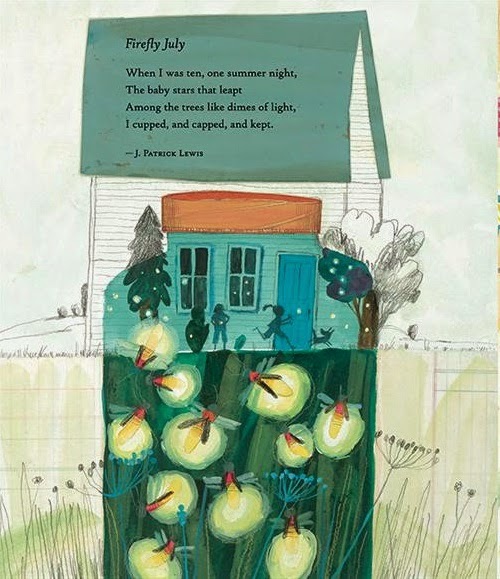 Take a look at the picture below, and notice how Sweet includes children just as silhouettes -- letting the fireflies take center stage, but inviting children to be part of the poem as well. 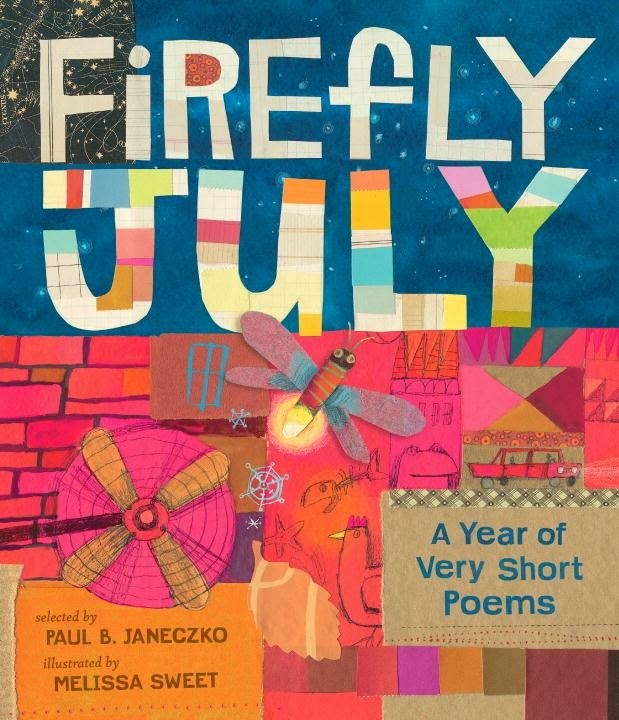 I absolutely agree with five starred reviews Firefly July has received! This is a delightful collection that children will enjoy returning to time and again. 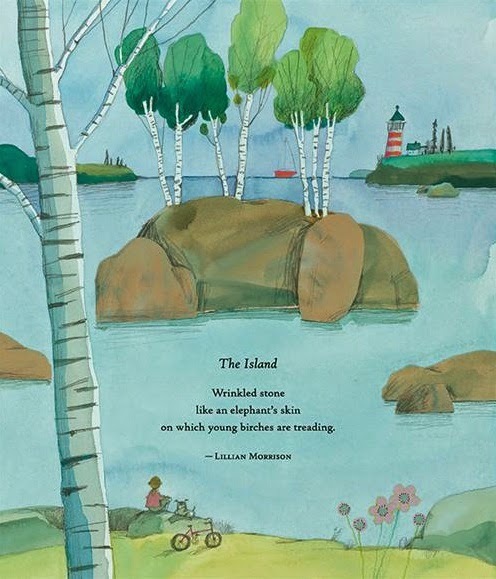 My sense is that this collection will captivate children from kindergarten through fourth grade, precisely because poetry can be read on so many different levels. For other reviews, check out Betsy Bird's review on SLJ's Fuse #8, and Anita Silvey's post on The Children's Book-a-Day Almanac. Illustration copyright ©2014 by Melissa Sweet. The review copy was kindly sent by the publishers, Candlewick Press. If you make a purchase using the Amazon links on this site, a small portion goes to Great Kid Books. Thank you for your support. Our book club has been reading the books nominated as part of the California Young Reader Medal awards. Each year, students across California vote on their favorite of thee nominated books. Our book club tries to take this beyond a popularity contest and practice evaluating the books we read thoughtfully. We talk about how well each book develops characters, plot, setting, and theme. We talk about the language, the pacing and the emotions in each book. Here's a review by one member, Emily S. I'm hoping we have more reviews to come! Recently I’ve been reading the California Young Reader Medal books that have been nominated this year. 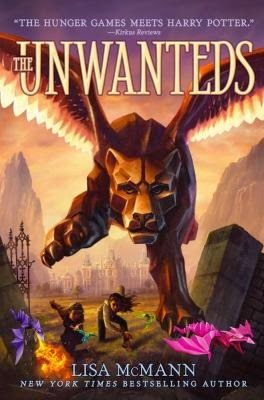 Recently I’ve finished The Unwanteds by Lisa McMann. This book is filled with excitement, adventure, twists, magic, and surprises. The book is about a thirteen year old boy named Alex Stowe. Alex is creative he is good at drawing usually that is a good thing, but in Quill the town Alex lives in creativity is a way to get sent to your grave. Alex gets sent to his grave awaiting his death. But to his surprise a eccentric magician named Mr. Today saves Alex and the other Unwanteds. I like this book because it is filled with fantasy creatures, surprises, twists, excitement, magic, and adventure. Something that I think could improve is the beginning. A few people say that the beginning is boring or dull, because it doesn’t have much excitement in the beginning. In fact it made me a tiny bit impatient because many people told me it was exciting. If you read the beginning and think that it is boring or dull try reading to page 25 and then see how you like the book. In conclusion this book is a great book especially if you like the Hunger Games, Harry Potter or other fantasy books about magic. Thanks, Emily! It was really interesting to hear your opinion about this book. The pacing in a book is so important. It isn't easy to establish strong characters, but also hook readers right from the beginning. Thank you for your thoughtful review. Sometimes my kids ask for a peanut butter and jelly sandwich because they are just craving comfort food. 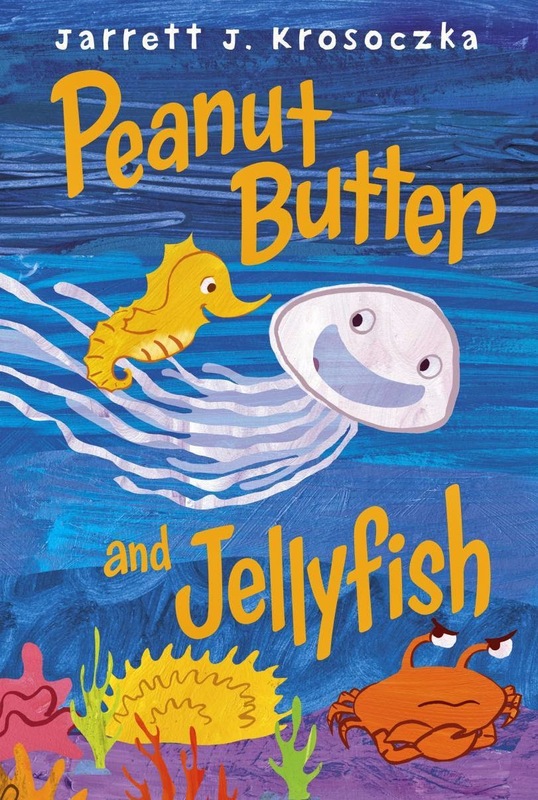 Jarrett Krosoczka's newest picture book, Peanut Butter and Jellyfish, is exactly like that -- comforting, a little gooey and certainly sweet. Reach for it if you're in the mood for something that will make you smile. Best friends Peanut Butter and Jellyfish love to swim up, down and around--all over their ocean home. But every time they swim past Crabby, he shouts out something mean to them, like: “What a bunch of bubbleheads!” or “You guys smell like rotten barnacles!” What is it with that guy? More importantly, what should these two happy friends do about it? When Crabby gets caught in a lobster trap, Peanut Butter and Jellyfish have to decide whether they're going to reach out to help him. Krosoczka's story touches just the right notes, creating empathy and suspense along the way. 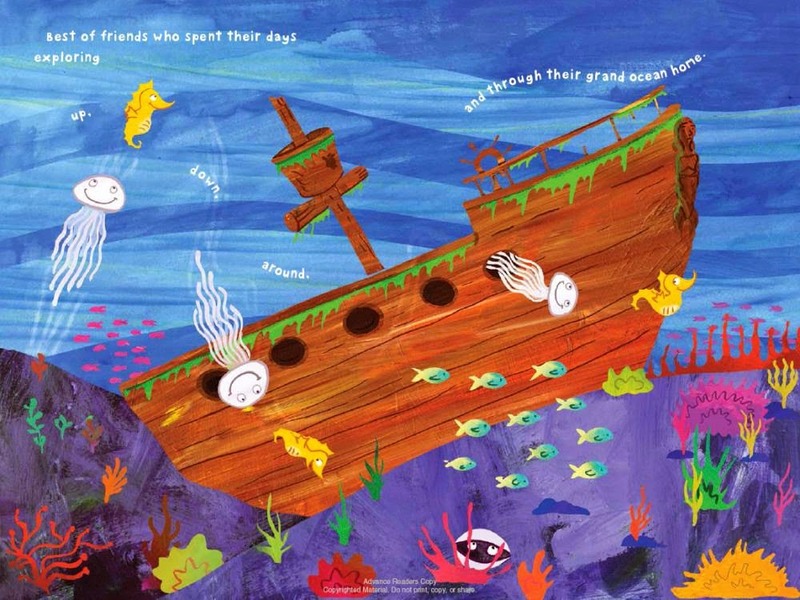 His artwork is bright and cheerful, with lots of kid appeal. Illustration copyright ©2014 by Jarrett J. Krosoczka. The review copy was kindly sent by the publishers, Knopf Books for Young Readers / Random House. If you make a purchase using the Amazon links on this site, a small portion goes to Great Kid Books. Thank you for your support.